Clint Eastwood's latest directorial venture is an entertaining portrait of Nelson Mandela's initial days as President of South Africa - and what a time it was! Leading a nation - "balancing black aspirations with white fears" and confronted with rising crime, Mandela plays a gamble by backing the National Rugby team - still considered in 1994 especially by many blacks, to be a symbol of apartheid. The team is not doing great either, plunging to defeat after defeat. With the Rugby World Cup (South Africa been the host nation) barely a year away, Mandela calls upon the team captain and asks him, without actually saying it, of a service - to win the 1995 World Cup. His hope, it seems, is that the entire nation will be united and inspired if this occurs. Invictus - after a poem that inspired Mandela during his 27-year long ordeal in prison, may seem to be another underdog story, but it is more about the courage to change and forgive, about taking that big risk to bring together a nation. 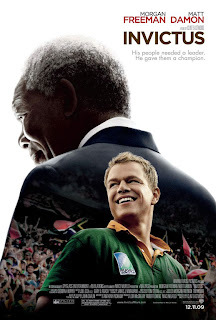 It is about Nelson Mandela, played so lovably by Morgan Freeman, while Matt Damon is competent as the Rugby team captain. Mandela's 'mixed' security personnel, his separated family, Damon's sceptical father and a little exaggerated part about the little poor boy.